Hello Guys, If you planning for Advertise of your site in front of the world. Now that’s easy for all to advertise your website on your facebook and get maximum visitors on your site. so It’s easy to advertise your website on the internet easily.Now Boost posts on facebook easily with paytm wallet. Recently, Facebook has added a new option for the boost advertise easily. 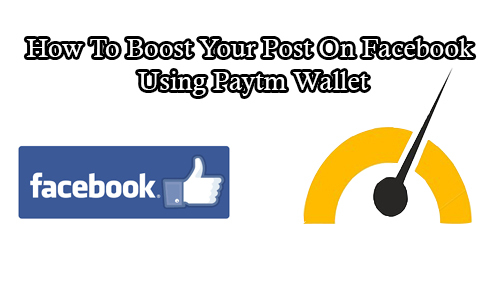 Now boost your Page Post, Page Article or Page Offer Easily on Facebook using Paytm wallet. Now you boost your post on facebook and give payment using paytm wallet. How to Boost Post on Facebook? Step 1: Go your fan page and select that post which you want to boost. Step 2: Now you see the preview of your advertisement. Step 3: Then, Select Duration, Account, Put Budget (Minimum Budget is Rs.50) After That Click On Boost. Step 4: Select Payment Method as a Paytm Wallet. Step 5: Then, Click on Continue It will redirect to the paytm website. Step 6: Done Payment Process and See yours advertise as a sponsored. By using It you will boost your visitors as well as also increased page like and website traffic also using boost post method. So, try and boost your post today because everyone has today paytm wallet. Now boosting is easy with the help of facebook and paytm wallet.